Guyana exhibited literary works, craft and fashion at the Carifesta Grand Cultural Market and Trade Fair on Wednesday in Suriname and its food stalls were a hit. Little sparkles of the green land of Guyana added to the ambience of the festivities and could be identified by the waving Golden Arrowheads which could be spotted from a distance. Just as one entered the gates of the Kamer van Koophandel en Fabriehken (KKF) complex (an organisation equivalent to the Georgetown Chamber of Commerce and Industry) were the country booths showcasing the crafts and culture of the various participating countries of Carifesta which started on August 16 and runs until Sunday. 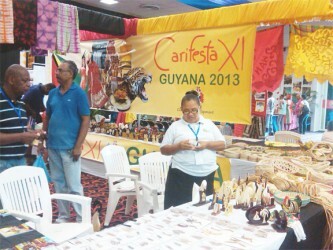 The Guyana booth was one of the popular exhibitors with craft from St Cuthbert’s Mission on the Mahaica River in a section of the display organised by the Guyana Arts and Crafts Producers Association. The Guyanese had tourism magazines to distribute for free but the craft items were on sale. Several participants reported that many people had asked about the GuyExpo Trade Fair. 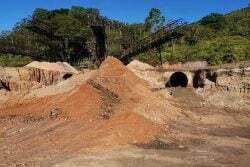 A lady who asked not to be named, stated that she wished that more emphasis had been placed on the upcoming National Exhibition and Amerindian Heritage Month. “These events are just a few days away and we should’ve come more prepared to promote Guyana. 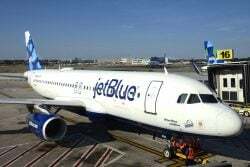 Sure we have our sets and magazines but we didn’t come with a tourism package to invite them over,” she said. A building away was the literary section. 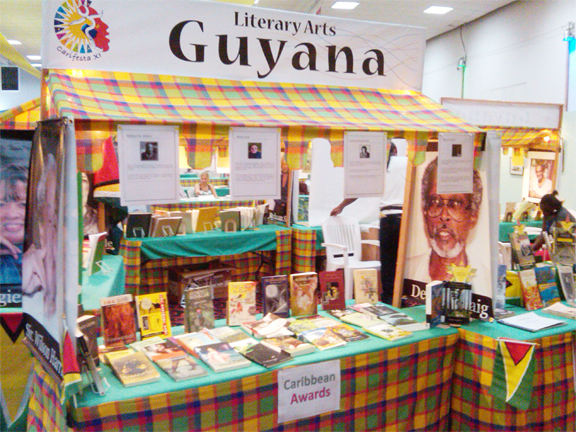 The University of Guyana Library managed this booth and featured the books of some of the Guyana Prize for Literature winners: Sir Wilson Harris, Mark McWatt, David Dabydeen, Cyril Dabydeen, Rooplall Monar, Grace Nichols, Marc Matthews, Harischandra Khemraj, Ruel Johnson, Berkley Semple, Paloma Mohamed, Ryhaan Shah, Pauline Melville, Raywat Deonandan, Michael Gilkes, Beryl Gilroy, Denise Harris, Harold Bascom, Roy Heath, Stanley Greaves, Elly Niland, and Haitian Myriam Chancy, winner of the Inaugural Guyana Prize for Literature Caribbean Award 2010. The three hundred-plus books exhibited were not for sale but could have been browsed. Guyana is known for its variety of dishes and excellence in the culinary arts. The Carnegie School of Home Economics did the Guyanese people proud as they attracted many visitors to their booth. Guyanese pepperpot, curry with rice or roti, cook-up rice, fried rice, black cake, fruit cake, metemgee, boil and fry ground provisions, mauby, float bake and saltfish, potroast and stir fried chicken were all on the menu. At Guyana’s booth one felt lucky to be served after the hassle of being in such a large crowd. The servers reported a solid turn out every evening and more often than not they ran out of dishes and would have to hurry into the kitchenette to whip up more. At the centre of the KKF Tarmac were other craft booths and it was here that most of the Guyanese contingent who came independently from the government-supported delegation were situated. Dellos Leather and Cummings Leather Establishment expressed their disappointment at the lack of support from both the government and the patrons who bypassed their booths because they were unfavourably positioned behind others. It was at one of these booths promoting Rastafarian craft that Stabroek News caught up with Brandon Harding, past GT&T Jingle winner. 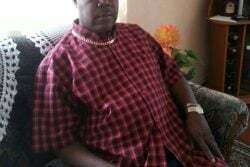 Harding expressed his pleasure at participating in Carifesta to represent Guyana. He related that on Sunday and Monday nights, he had been featured on the Grand Cultural Market’s stage. Sonia Noel had her signature designs on display in the fashion section and it was there she debuted her new magazine, Makin’ Style. 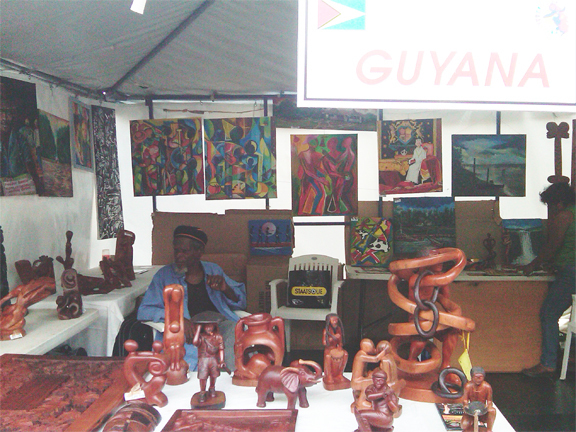 Other Caricom countries and independent artistes showcased their visual arts, craft, fashion, culinary skills, literature and national heritage. The Grand Cultural Market and Trade Fair concluded on Friday, August 23. On Tuesday under the theme ‘Rhythms of the People’, Guyana’s presentation at Carifesta XI’s country night was one of colour, culture, vibes and national heritage as the Cooperative Republic dazzled the thousands in attendance at Independence Square, Paramaribo. 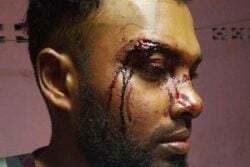 which prompted onlookers to stand in respect for the neighbouring country. A dance was next on the programme for ‘Guyana Night’ where performers gyrated to patriotic songs like Beautiful Guyana, written by Hilton Hemerding and other local classics by Dave Martins and the Trade Winds. What caught the audience’s attention was a dancer costumed in an Amerindian Chief’s cultural attire in Guyana’s national colours, solo dancing on the stage before being joined by the beautiful surrounding forest (other dancers costumed as flora and fauna). Dancers Kijana Lewis and Dominic Alleyne were notable in this presentation. Team Guyana pleasantly surprised onlookers with their varied Afro-Latin dances, Dutch, Chinese and European pieces which were a refreshing change from just the usual Afro-Caribbean and Indo-Caribbean choreography. This was well received by the audience. The Whaul Sisters (Lawanda, Ayanna and Akeeda) sang the Guyanese folk song Bamboo Fyah while Guyanese musicians played the tassa drum, shak shak, triangle and Djembe (African drum) to accompany them. 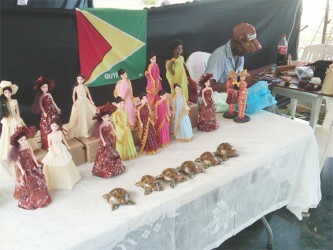 This was then followed by a mini fashion display showcasing Guyanese fashion. African dances and Kathak followed on the agenda before an interpretive dance piece with European influences. Bollywood and Chutney dances were also part of the Guyana cultural display but a definite favourite of the audience was a dance clash between Kijana Lewis doing an African cultural dance and Jamal Ellis, past finalist from the ‘Feel the Beat’ Dance Competition with breakdancing moves – the audience was really enthused by that dance-off with different styles in one item. To conclude the presentation ninety minutes later, 2013 Chutney Monarch Roger ‘Young Bill Rogers’ Hinds took to the stage with one of his calypso songs as masqueraders danced around him, prelude to all the participants of ‘Guyana Night’ coming on stage in their colourful costumes. Musicians and dancers alike all gyrated in the finale in a cultural display depicting Mashramani.